This is the first part of my review of the Alternative View II conference At Heathrow airport, London, England UK. The rest of my report will be added in future articles. 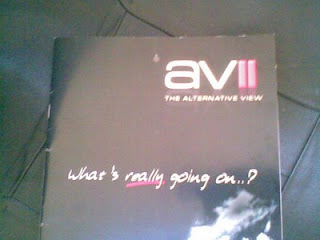 Here’s the website of Alternative View II: http://www.avll.co.uk/index1.php . Ian has booked all the domains up to “AV14” so there is the potential there for many conferences to come in the future. I’ve made a HPANWO TV video diary of the event here: http://hpanwo-tv.blogspot.com/2009/06/alternative-view-ii.html . It was great to be traveling with Ustane again. We both have a joint interest in everything discussed there and both enjoy sharing the experience. The venue was the Thistle Hotel at Heathrow Airport, adding to the event’s international and mainstream feel. In fact one of the reasons the organizers chose the venue was to make it easier for delegates and speakers to get there from abroad after the first AV conference which was held in Totnes, Devon; as circumstances would reveal, it was a wise choice. I was having dinner with the professor in the lab (The Canteen was closed due to a pea being trapped in the kitchen sink). We were eating roast pork, the professor's favourite. A gust of wind blew in through an open window and knocked me off my chair. My head connected with the door to the Smallpox safe and, by terrible ill fortune, my cranium accidentally hit the buttons on the combination lock pad in the correct sequence and the door opened. I had my hand in my pocket and as I put it out to steady myself a test-tube of Tuberculosis (which I'd forgotten to take out of my pocket the night before) flew across the closet and smashed into the Smallpox ones. The material inside all the test-tubes all shattered and combined; then the blended concoction formed a vapour, drifted out of the closet and combined with the roast pork on the table, by complete accident, to form a virulent hybrid called Swine Flu! "OOPS!" I said. I mean, it’s not terribly likely is it? If the government wants to introduce something really deadly then they could do so with impunity. They have total deniability. No police investigation could ever trace a disease back to its creator. We’re talking about a Genocide license! Man-made viruses, because they are new viruses, also have no “cleavage sites”. Cleavage sites are cell receptors which immune system cells can use to identify the virus and latch onto it. A virus without cleavage sites is effectively a secret agent, completely undercover and disguised. These viruses mutate and recombine rapidly until eventually they settle down. Natural viruses like cold and flu are settled. HIV, the supposed AIDS virus, is not; it also has no cleavage sites. According to Len, this means AIDS has to be man-made. If it was an ancient virus from the jungles of Africa then it would have settled. This is an interesting addition to the debate. Personally I’m not convinced that the HIV virus is the cause of AIDS at all, but that’s a story for another time. The new Swine Flu virus is the same. Oddly enough some of its genes come from North American strains and some from Eurasia; so how on Earth did it end up in Mexico? The 1950’s polio vaccine is another example Len sites. It contained viruses that were supposed to be dead, but it turns out that they were alive; the virus was the one that causes viral meningitis and some cancers. It also caused coma and paralysis in monkeys. So millions of people were injected with neurotoxic and carcinogenic viruses and the governments did nothing to stop it. In 1972, President Nixon gave cancer research a new home: Fort Detrick in Maryland. Amazingly, and almost predictably, Fort Detrick is also the headquarters of the American biological warfare programme. Today, modern viruses for vaccines are grown in birds eggs; the environment accelerates mutation. The players in this game have names that you may recognize like the CDC, Centre for Disease Control, in Atlanta USA. Another is Baxter; and I recognize this name because it is on a lot of the products used at the NHS hospital where I serve. Baxter come up with some incredulous stories as excuses to explain these emerging viruses, like how two strains accidentally combined in a Swiss train crash! It’s even dafter than the imaginary example I gave above, a real “the dog ate my homework book” cop-out. This is especially suspicious in that the people infected by this outbreak were released from hospital immediately after first aid. It’s possible that this incident is the release of the “Big One” that Len predicts, the mass-pandemic that will be used for “priming” us. Baxter have a track record for such “blunders” They were sued by some AIDS sufferers after they received the virus thorough contaminated heparin, an anticoagulant, that was put into blood for transfusions. Len should be taken seriously when he says he’s identified the release of the “Big One” because he’s made such predictions before and they’ve been proved correct by subsequent events. He called the FBI to tell them where the strain from the post-9/11 anthrax mailings came from. As a result, rather than thanking him, the FBI made him a suspect! They questioned him for hours before releasing him after Len demanded that they either charge him or shut up. Len later found out that the university laboratory where the anthrax came from is under the control of the CIA! Maybe this is why the police never solved the crime. I didn’t know this, but interestingly the Human Genome Project has been privatized; it happened just before its completion. It is currently run by a company called Acambis. Acambis produced cow-pus for smallpox vaccines back in 1902 and were involved in the first Eugenics and population control projects run by the Rockefellers in the early 20th century. They had long conferences and experiments to find out which races were most prone to which diseases. Contrary to official history, the Nazi’s didn’t invent Eugenics; they merely took it over from the Rockefellers. In fact the Rockefellers attended the Eugenics conferences hosted in Nazi Germany in the 1930’s. After the war when the Nazis had fallen the Eugenics movement didn’t fall with them, they simply passed the buck back to the United States; and this is where it is located today; it is the modern bioterrorist agenda. The Rockefeller empire is still in the driving seat. The Council on Foreign Relations, which is part of the Round Table network which is run by the Bilderberg Group, want the US population reduced from its current 300 million to 140 million. How do they plan to achieve that? Genocide; there is no other way. Genocide by intoxication. In the 1920’s the Rockefellers commissioned the Flexner Report which was a kind of proto-Codex Alimentarius. It attacked the natural health, medicine and food industry, including massage and yoga! It also promoted vaccinations. I was given the Hepatitis B vaccine when I joined the Hospital Portering Service and I wish I hadn’t. Today it is being offered to children! Why? Hepatitis B is a blood-born disease and is also sexually-transmittable. Only hospital staff like myself or sexually-active adults are at risk, so why do kids need it? They don’t. Len stresses: NEVER get vaccinated. NEVER allow your children to be vaccinated. He’s invented a new word: “omnicide” the killing of everything. Could omnicide be related to my own theory of “Gotterdammerung”? (See: http://hpanwo.blogspot.com/2008/03/large-hadron-collider.html . The people behind this are capable of doing this because they’re inhuman, aliens. Ian Crane calls it “pathocracy”. Len ended his talk by saying “That’s the bad news” and promising to give us the good news in his next address on Saturday. Len Horowitz has been criticized by many of my fellow researchers for accepting a POC- Papal Order of Chivalry, a knighthood from the Pope. It was probably not a good idea for Len to cooperate with that. Because of our views on the Vatican and its corruption it was bound to lead to him being accused of selling out or being a disinformer, but I conclude he did so in all innocence. After all a lot of people have POC’s; my own grandfather had one! As I said here: http://hpanwo.blogspot.com/2009/03/bad-science-by-ben-goldacre_25.html , why won’t Ben Goldacre debate Len Horowitz instead of picking on lightweights like Gillian McKeith and Dr Peter Fisher? Goldy says he enjoys winning arguments so much it’s virtually his hobby. He prides himself on being a master-debater, which I’m sure he is! So why not challenge Len Horowitz? Could it be because Horowitz would have him for breakfast? Goldy never mentions Len at all in his book and only refers to Arpad Pusztai in one sentence. I liked Len a lot and Ustane virtually fell in love with him! I left the conference hall looking forward very much to his next address. I first encountered Andy Thomas when I watched a TV show in 1999. It was a very special TV show because it was one that really gave me a kick up the arse and woke me up. It was the first step on the journey that I’m on now, the one where I discover that the world is not what I previously thought it was. This is it: http://www.youtube.com/watch?v=bNrsx-7nxKI . He is best known for being a crop circle-researcher, but he’s also branching out into many other areas. Andy’s speech was divided into two parts; in the first half he went into the issues associated with this world, and in the second he addressed the esoteric forces behind it. He began by talking about the unusual inauguration of President Barack Obama. After the inauguration was over, rumours began spreading that Obama was not really the President; this was because he misread his oath. The correct oath goes: I swear… to faithfully execute my duties as President of the United States”. Obama put the “faithfully” at the end, making a subtle but important difference. It was a big enough to make his lawyers’ ears prick up and Obama retook the oath the following day. However this time he did it in private at the White House with only the legal bare minimum of witnesses and no press. The White House spokesman said that this was in order to “avoid conspiracy theories” and this is a very revealing thing to say; it suggests that conspiracy theorists, like myself, are such a powerful force in politics and public relations. In fact I’d go as far as to say that today’s era is comparable to that immediately succeeding the Kennedy assassination. (Not all conspiracy theories on Obama are true though; for instance he is NOT Lewis Hamilton’s father!) Another theory is that Obama cannot be President because he was born in Kenya. Under current law a President has to be American-born (Until Arnold Schwarzenegger gets it changed of course!) He has a Hawaiian birth certificate, but it is alleged to be fake. If he was born on Hawaii then he is lucky because his birth occurred just after the Islands were declared a State of the Union. A few months earlier Hawaii was a United States Trust Territory like Puerto Rico still is today. Obama is popular like no other US President in recent history. I spoke here of the “Barack Obama parties that accompanied the night of his inauguration: http://hpanwo-voice.blogspot.com/2009/01/barack-obamas-inauguration.html . He’s even appeared in the Marvel Comics! The reason for his popularity is basically because he replaced a President who was so unpopular. By the time he left office George W Bush was more reviled that Nixon. As a man of colour Obama is also assumed to be anti-establishment. But is he? It’s worth noting that many of his advisers are the same people who advised previous regimes; one of them, Zbigniew Brzezinski is a fascist whom I’ve mentioned before. He has written books on how to take over the world. Obama is still supporting the War on Terror. But the hope people have in Obama is real, says Andy; the desire for change associated with him should not be scoffed at. We don’t know Obama, what his motives and feelings are so he deserves a chance. Here I have to differ with Andy. I doubt he’d have been allowed to be President if he’d been a genuine guy. It’s possible he may be a genuine guy, but then if he is… he’d better be careful not to drive past any school book depositories! But at least he is well-spoken and intelligent which is more than can be said for Bush. Andy also has an admiration for the British Parliamentary system which I do not share. Despite the scandals over first class train tickets and garden ornaments the British Parliament is a model on which all others have been built and it has taken a long hard struggle on our behalf to create it. I know that the people who created and supported Parliament were motivated by noble intentions, but for me that’s the problem. When noble intentions and a desire to do good get blinkered and led down a cul-de-sac then the intentions betray their own ambitions; and this is exactly how I feel about Barack Obama too. Both Obama and Democracy in general give us the illusion of freedom and choice and this is the very reason Democracy exists, to befuddle us! It’s also a buzz-word, an example of neurolinguistic programming. The very mention of the word conjures up warm and secure feeling inside; some people even start weeping, “My granddaddy died for Democracy!” etc. Poor man, giving his life so we the people can put a cross on a piece of paper every four years and choose our government’s public-relations officer! Democracy is actually the second-biggest con-trick that the Illuminati have ever played on the human race, the biggest being religion. In this sense I think, although I like him and respect his information, Andy misses the Big Picture. I also admire Brian Gerrish and consider myself part of his mission, but I think Brian does the same as Andy and I’ll address that when I review his speech. Andy and I differ too when he says we ought to vote. I’m not on the electoral register, but even if I was I would boycott all regular elections. Andy is concerned a low turnout might give “extremists” like the BNP or pro-EU parties power (As it happens this is fear unfounded in the contemporary council elections: http://news.bbc.co.uk/1/shared/bsp/hi/elections/local_council/09/html/region_99999.stm). I’m opposed to the BNP (See: http://hpanwo.blogspot.com/2008/11/british-national-party.html) but this doesn’t mean I’m willing to vote for other fascists like Labour or Conservative to keep them out of the council chamber (Labour and the Conservatives are far worse fascists than the BNP in some ways!). I repeat: Democracy is a con and to take part in it is to give credence to a system that deserves none. It needs to be replaced! When it comes to elections though, I would vote in an EU referendum because here the situation is different. And on this occasion taking part in voting has shown the system up for what it is. The Irish are currently being bullied into accepting the Lisbon Treaty despite being “given the choice” in a referendum and rejecting it. The same happened with the Maastricht Treaty in the previous decade. As many have predicted, the “No” vote in Ireland has not been accepted and the electorate are being threatened with grim portents about the Recession unless they change their minds. See here: http://www.wethepeople.ie/ . The Recession is being used as what David Icke calls a “Problem-Reaction-Solution” in many circumstances. It will be used to justify further unification and tighter controls on the economy and banking system. The growing crime rates and disorder that inevitably accompanies economic instability will vindicate the increasing use of Orwellian state surveillance and laws. There are over 4 million security cameras in the UK; that’s one for every 6 people, more than any other country on Earth! All our emails are recorded, all our phonecalls are monitored and every letter we send can be intercepted. Big Brother is watching you… sitting on the effin’ toilet! Andy sums our situation up very perceptively when he says that everything in our society seems designed to crush our spirit (Brian Gerrish echoes this with comparable eloquence: “Nothing works anymore”). And this defines our challenge: We must not let our spirit be crushed. Andy feels that the UK, especially England, has a pivotal role to play in the current and future rebellion against the New World Order. England is often identified as the Heart-Chakra of the Earth. It has more sacred prehistoric antiquities than any other place on Earth; Stonehenge and Avebury are just the most famous of several hundred monuments (A new one has recently been discovered in Oxford that could be the biggest ever found! See here: http://hpanwo.blogspot.com/2008/07/prehistoric-henge-found-in-oxford.html) England is also the place where most crop circles appear. It could once have been part of Atlantis. The presence of the London Olympics will focus the whole world’s attention on England and this adds to the feeling Andy has, and I share, that this country has a very special part to play. Andy moved on to explain how he has analyzed the portrayal of conspiracy theorists in the media. We’re usually depicted with tin foil hats, buck teeth and thick glasses sitting in front of computers in our bedroom in our mum and dad’s house. Andy and Marcus Allen (Marcus also appears in the Jon Ronson show which effected me so deeply) were interviewed for two hours for The One Show, but when the programme was broadcast their testimony had been cut down to 30 seconds! But in reality conspiracy theorists are all kinds of people; they include serious scientists like David Ray Griffin and famous media personalities like Dr David Bellamy (whose AVII address I’ll review in a later segment of this article). So, although we have a duty to spread the information from the conference beyond its walls we must not expect any thanks for it! We have been ridiculed in popular culture so ridicule is mostly what we shall receive. Andy has written a book called The Truth Agenda. It’s about upheaval and transformation and this is happening. The long predicted date, 21/12/2012, is significant but don’t be too disappointed if nothing happens on that exact day; the explosion it creates may be silent and may not be felt for a long time afterwards. It’s unlikely to be like it is in the film 2012. Here’s a trailer for it: http://www.youtube.com/watch?v=gVi_2lHBVhQ . (Seeing as it’s directed by Roland Emmerich I’ll probably give it a miss!) But 2012 is different from other prophesies; unlike the Gregorian Calendar’s second millennium, which we experienced 9 years ago and was a massive anticlimax, 2012 is predicted by many different cultures across the globe. The famous “psychonaut” Terence McKenna worked out that the date is encoded into the I-Ching. The Maories of New Zealand also have myths associated with 2012; so do the Zulus, according the Credo Mutwa. I’ve bought 2012-researcher Geoff Stray’s book on the subject Beyond 2012 (See the HPANWO TV broadcast above) and here is a lecture by the author: http://video.google.com/videoplay?docid=-3364118102583960237&ei=4DEqSoeSO4Xt-Aav-JHACQ&q=geoff+stray . It’s also backed up by science. Some geological and astronomical theories point to that same date. The Earth’s magnetic field is weakening and becoming chaotic, a sure prognosis of an approaching pole shift. All the planets are changing; Mars is getting warmer and Mercury is developing an atmosphere; even the moon is producing a very thin one. The sun is acting strangely too; the solar maximum has failed to arrive on schedule and there’s a curious lack of sunspots. The last time this happened, the “Maunder Minimum” it preceded a massive climate change. When the sunspots finally do show up the Earth’s unstable magnetic field will not be able to shield us from the radiation as well as it normally does. This could result in more paranormal activity because more DMT, an internal psychedelic chemical, is released by the brain’s pineal gland. Dr Michael Persinger, a scientist who studies altered states of consciousness, says that paranormal reports often occur at times of high solar activity. Each long count age is called a “sun” and the fifth and last one of the current 26,000 year precessional cycle ends on 21/12/2012; so this is an event that not only happens every 5,125 years, but also only once every 26,000 years. (Andy’s wife Helen Sewell also addressed the conference and said more on this subject; see below later) This is also the sge which ends with “demons” (Some Ancient American cultures say “jaguars”) coming down from the sky! What will that mean!? The demons are called Tzitzimitls and there’s a picture in Geoff’s book of them; they don’t look friendly! 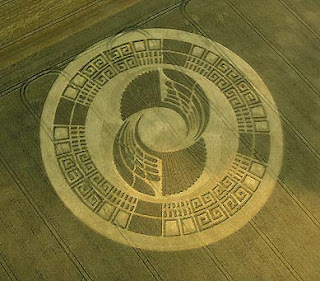 Some crop circles have a 2012 theme; there have been some appearing with depictions of the Mayan calendar and the positions of the planets and stars on that date. Evangelical Christians in America are trying to make passages in the Book of Revelations fit into the 2012 prophesies. 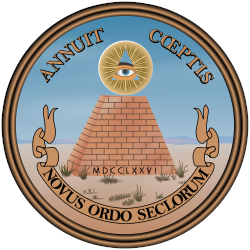 But when it comes to any kind of prediction, the Illuminati will know about it long before we do, what with their occult knowledge and secret science. They will do everything they can to deprive us of any of 2012’s positive effects. We must resist, but not get carried away. David Icke says the same and puts it as: “please don’t riot”. Smashing in the windows of MacDonalds, voting BNP, hurling abuse at policemen; this is exactly what our rulers want us to do. Nobody knows for sure what will happen in 2012; and David Wilcock points out that even the best clairvoyants can’t see what events are going to take place in that year. Andy warns us that, like the Millennium, 2012 could end up as a damp squib; but if it does, don’t lose heart. On the other hand, something big might happen, probably something nobody has predicted, and we have to be prepared for that as well! I seen your blog and find details about the Giant Chess you are shown nice info regarding "Alternative View II- Part 1" and it is awesome for in this because of this nice blog i am really very much glad. Hi Giant Chess. Thanks for your comments. Unfortunately my garden is too small for the macro-version of Chess and I'll have to stick to the table-top scale! That doesn't surprise me at all, Anon'. Gradually, bit-by-bit, the authorities are increasing their imposition. Well done for standing up to "the Man" over this issue. I'm sorry you lost your job, but it seems to be the way they're threatening us. The same thing is being done in the NHS, especially with this Swine Flu business! Pretty soon I'll probably be faced with the same choice as you... and I hope I'll have the guts to do what you did and resist. I can 'resist' because I have no family, no responsibilities, and no mounting debt. Most people are not so lucky...it's a hard decision when your livelihood depends on it. I think a lot more people will be faced with the same decision soon, but won't have the same freedom to refuse that I had. "This could result in more paranormal activity because more DMT, an internal psychedelic chemical, is released by the brain’s pineal gland"
...and there's your reason for the fluoridation of the water. The powers-that-be don't want any spiritual experiences happening to just anyone. Check out 'The Effect of Fluoride on the Physiology of the Pineal Gland' by Jennifer Anne Luke, from 1997 - if it hasn't been referred to before. Enjoyed reading your blog very much. Wish I could've gone to AV2. And the man doing the lecture said esactly this. But see my comment on the article. I will check it out, Mark. Glad you like HPANWO; thanks. The calcification caused by fluoride is even mentioned in the Wikipedia article on the Pineal Gland. What you said about the Powers-that-be having a liking for fluoride is just that in a nutshell. They want to put spiritual blindfolds on us! This is why it's put in toothpaste too. It's got sweet FA to do with strengthening our teeth! I've read the DMT book by Rick Strassman and it all fits like a jigsaw! It may be worth getting a filter, if you haven't already thought of it, because you live very close to the West Midlands where the drinking water has been actively fluoridated for some time. I relate Credo Mutwa's testimony about how his rulers in South Africa tried to spiritually blindfold Zulu children. Thanks for your replies Ben. Not far from the West Mids conurbation here. But equally not far from the Malvern Hills. Take a drive up there every week or so, and get 30 or so litres from the springs. So... unless TPTB are actively doctoring spring water I'm recommending Malvern! It's fine water. There's an aloe vera toothpaste at Holland and Barrett that's fluoride-free and very nice. Interestingly, the box it comes in announces that it's fluoride-free. They know they have an anti-fluoride market. Gonna check out that link to the swine flu blog now, Ben. Many thanks. Hi Mark. I use Tom's of Maine toothpaste which is very nice indeed. I've felt a lot better since I stopped using Colgate. I've written to Thames Water explaining what I think of fluoride. The Nazis used it concentration camps to stop the prisoners from rioting or trying to escape etc. I don't know what state my own Pineal Gland is in, but hopefully now I'm on the non-fluoride toothpaste it will be ok; we don't yet have active fluoridation in Oxford. Yes, the Malvern hills is a beautiful pure place and it's water deserves its repuation. Let's hope the nanny-state doesn't find some ewxcuse to poison the springs with antibacterial chemicals "for the safety of the consumer"! I've replied to you rcomment on the Swine Flu article. Would you like to join the HPANWO Forum? It will make discussion of the subjects of the blog far easier. to shoot you an e-mail. I've got some creative ideas for your blog you might be interested in hearing. Either way, great site and I look forward to seeing it develop over time. Gday, I am new to blogging and websites in general and was wondering how you got the "www" included in your domain name? and my domain looks like, "http://mydomain.com". using the exact same theme as me. The only problem is on my website, I'm unable to get the design and style looking like yours. Would you mind emailing me at: lawannahales@gmail.com so I can get this figured out. By the way I have bookmarked your internet site: http://www.blogger.com/comment.g?blogID=954399895702774449&postID=6297910580229577398 and will certainly be visiting frequently. Thankyou! domain name: http://www.blogger.com/comment.g?blogID=954399895702774449&postID=6297910580229577398 and guess who already acquired it? You did! haha j/k. I was about to buy this domain name but realized it had been taken so I figured I'd come check it out. Great blog! the webpage pretty bad. If you want you can email me at: zane-mcfadden@gmail. I hope this is all right with you, I'm making an attempt to give your great blog a bit more publicity. Be back soon. go for a paid option? There are so many options out there that I'm completely confused .. Any recommendations? Many thanks! I hope this is alright with you, I'm making an attempt to give your fantastic blog a bit more visibility. Be back soon. A lot of times it's challenging to get that "perfect balance" between usability and appearance. I must say you have done a superb job with this. Also, the blog loads very quick for me on Firefox. Outstanding Blog! net the simplest factor to understand of. I say to you, I definitely get annoyed whilst folks consider concerns that they plainly do not realize about. I don't have time to read through it all at the minute but I have bookmarked it and also included your RSS feeds, so when I have time I will be back to read much more, Please do keep up the awesome job. Can I simply just say what a comfort to discover someone who really knows what they're talking about online. You definitely understand how to bring an issue to light and make it important. More and more people have to look at this and understand this side of the story. I was surprised that you are not more popular since you most certainly have the gift. read аll these commentѕ рropeгly. I'm trying to build a similar website to this myself, there's a huge amount of effort thаt goeѕ into іt. here, not easy to gеt. web page as a best website for hottest updates. who genuinely understands what they're talking about on the web. You definitely understand how to bring an issue to light and make it important. A lot more people need to check this out and understand this side of the story. I was surprised that you aren't more popular since you certainly possess the gift. Hi, Neat post. There's a problem along with your web site in web explorer, could test this? IE still is the market chief and a huge part of people will omit your fantastic writing because of this problem. with genuine 34 cut diamonds while subtle detailing works are accented on the heart-shaped Krysterna crystal located above the date indicator. your Web link: http://www.blogger.com/comment.g?blogID=954399895702774449&postID=6297910580229577398 is being flagged as a possibly malicious web site in my web browser ie. You could certainly lose a lot of readers due to this issue. site. Reading this information So i'm satisfied to exhibit that I have an incredibly good uncanny feeling I discovered exactly what I needed. I such a lot without a doubt will make certain to don?t put out of your mind this site and give it a look regularly.